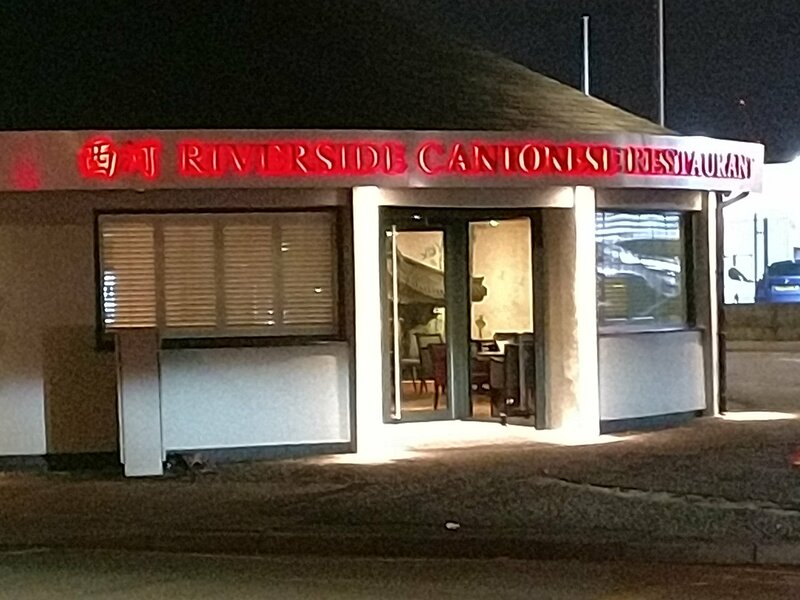 The Riverside Cantonese has been a Cardiff institution for as long as I can remember, having served customer from its Riverside (as in the area of Cardiff abutting the Taff river) location for seemingly eons. The old gaff had been looking a bit tatty for a while and in need of a serious make over or a move to a new location. Parking there was also a ginormous pain in the “riverside”. They took the new premises option and recently moved to a new location on the Canton (apt I suppose for a Cantonese) side of Ninian Park Railway Station. So now more trackside that riverside (not really catchy is it – but allows, as per the blog title, for rail analogues). I have enjoyed meals at the old location over the years (including a rather bountiful dim sum lunch with work) and a much delayed catch up with friends gave me a good excuse to check out their new premise. It is on the site of where there has been many a dodgy pub/eatery over the years, with the clear advantage of a large car park. Inside it is a large open space, with an open kitchen. Fairly minimally decorated, the main “interior design” issue is the acoustics. With the wooden floors and bare walls, noise bounces around and it can be hard to hear others talk over the constant din. Needs something to dampen the noise – bit of carpet maybe. 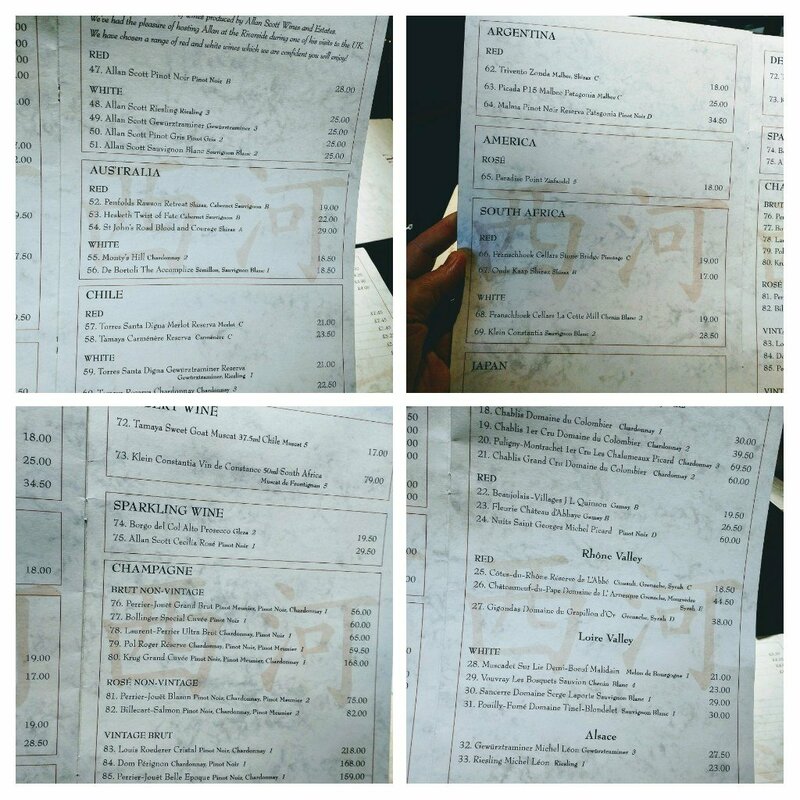 and the al a carte menu (the latter my preference – but we would probably have been all day deciding), the consensus (I was out voted) was to go for one of the set menu meals (possibly in hindsight a mistake). It was then a question of deciding which one. The level of choice is always a point of contention in Chinese restaurants (the menu does, however, seem a tad more concise than I remember from the old place). 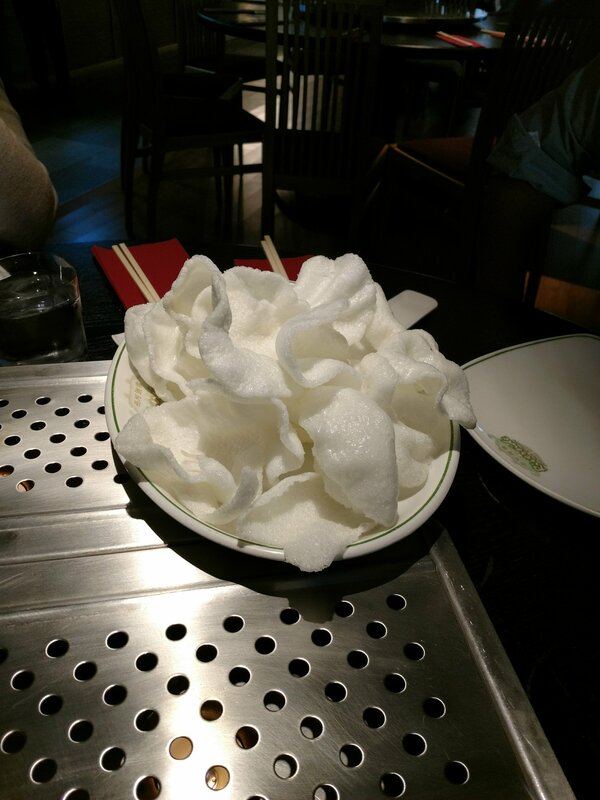 After several attempts to flag down one of the (not very many – more on this later) waiting staff, we got our order in and a regulation bowl of prawn crackers was brought to the table. Always a real crowd pleasers these, so long as they are suitably crispy (which they were). Perfectly pleasant and plentiful stuff, if a touch lacking on the flavour front. Missing something to give it all a bit of oomph. After this the wheels started to seriously come off service wise. Anticipating our barbecued spare ribs next, we were surprised when rice bowls started to be placed on the table implying the mains would be arriving next. We explained to the waitress that we hadn’t had our ribs yet and off the bowls went and then we waited. A good 15 minutes later the (clearly forgotten) ribs arrived. I thought these had a decent flavour and the flesh that there was pulled away from the bones cleanly. The qualms re this dish were the BBQ sauce was a tad gloopy in texture and some of the ribs were a bit lacking in meat and somewhat gristly. More napkins and more than one finger bowl (which when it arrived was scaldingly hot – luckily the copious amounts of steam coming off it forewarned us as to its searing temperature) for four people would also have be nice. We tried to attract someone’s attention to issues like the finger bowl, but eventually gave up such attempts as a lost cause. Once the rib detritus had been removed, we expected a small gap before the mains arrived. This expected short gap got longer and longer, with us asking the waiting staff on no less than 3 occasions where our food was. 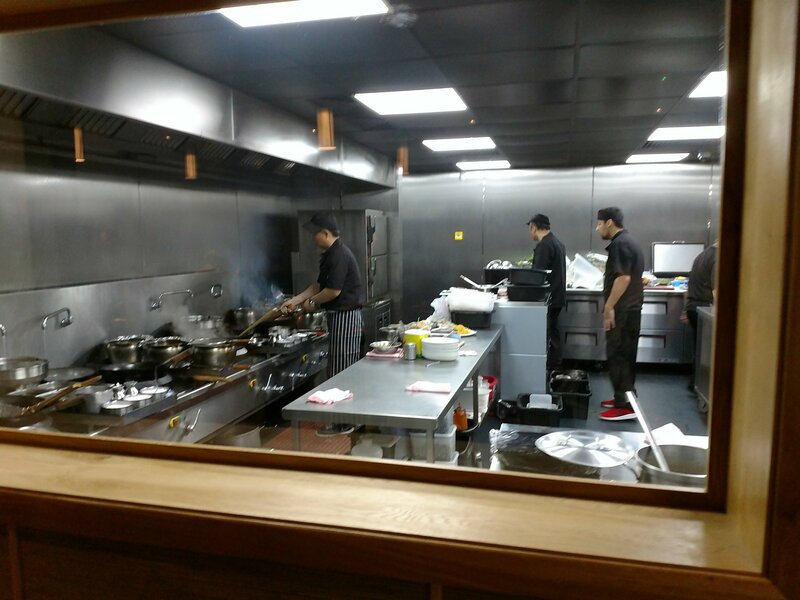 Big kitchen – not many people in it! or front of house (both rushed off their feet – not their fault as just not enough of them). There was also a seemingly quite chaotic system whereby there was no logic as to what tables got their food first. Certainly didn’t correlate to when you ordered, as far as we could tell, as those table (seated well after us) who ordered al a carte items seemed to get their dishes fairly quickly whereas those (like us) ordering the set menus had to wait and wait. In terms of the mains, these were fine if lacking somewhat in excitement. The fillet steak was a bit chewy (I seriously worry as to what needs to be done to “fillet steak” to get it that chewy – did they boil it or was it something else?) and the dish as a whole was very heavy on the onions and light on the steak. The lemon chicken was a bit MS heavy and the coating a little soggy. 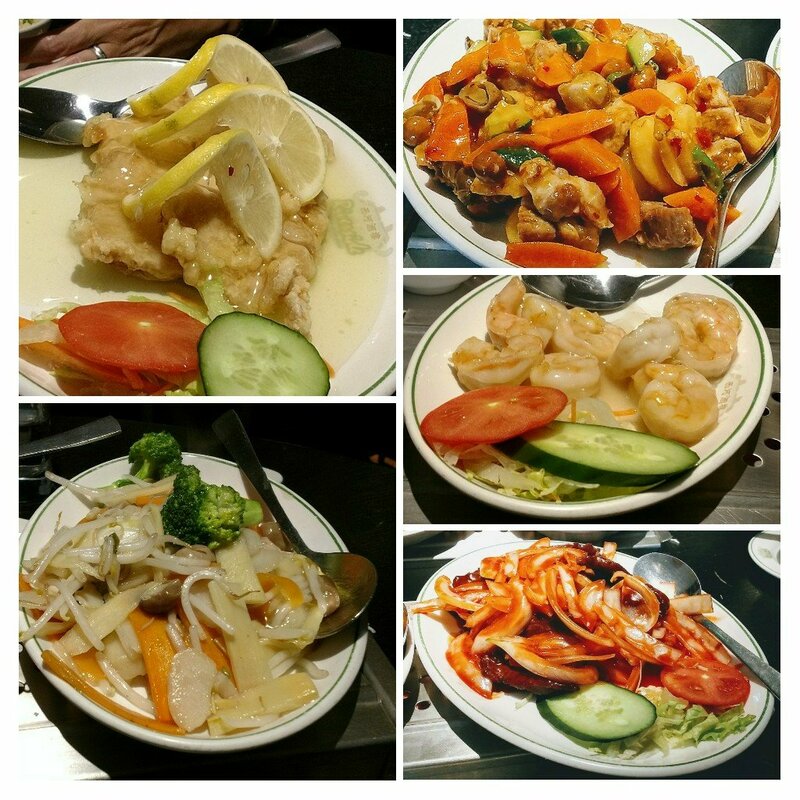 On the positive side the kung po pork had a decent enough chilli hit to it and a good ratio of tender pork to veggies and the crystal prawns were nicely cooked and plump. The pick of the mains was the duck dish. 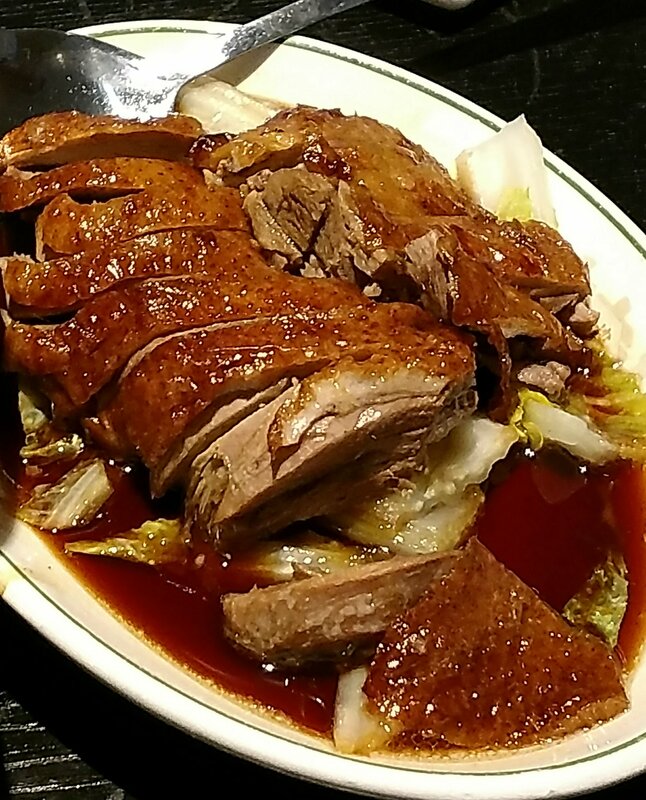 Tender, flavoursome, duck with a crisp skin and a nice rich, sweet (but not too sweet) sauce hit the spot nicely. The fried rice and monks veg. dishes were nice enough, with plentiful stuff of interest studding the rice. The monks’ vegetable dish was a bit heavy on water chestnuts, which Mrs. SF loathes and I find a bit bland (think they are added as filler personally) but assume some people must like them. All in all pretty regulation stuff, lacking somewhat in terms of a wow factor, and ruined somewhat by the glacial slowness of the service. 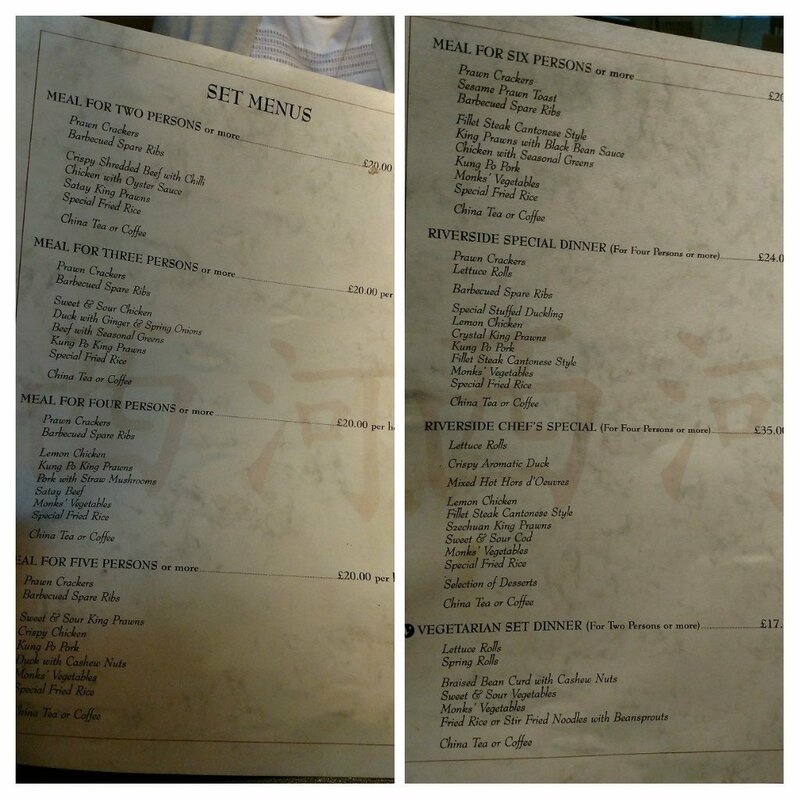 We started off with a round of Chinese beers (£3.60 a pop) as we perused the menu and wine list. The wine list has a reasonable selection and all the hallmarks of sourced via Fine Wines Direct UK, with Allan Scott wines much in evidence. Prices are not horrific, with (by way of example) the Allan Scott NZ riesling being £25 on the list (retails at around £12) and a St. John’s Blood and Courage Shiraz at £29 on the list (retails at around £15). Just off dry, this was pleasantly zingy with lime and other citrus fruits on the palate and touch of honeysuckle on the nose. It worked very well with the food. The bargain price (a typo I think at £37) for the Pesquara Reserva (a fab Ribera del Duero wine) I spied on the list at the old venue a while ago regrettably seems to have been picked up and adjusted accordingly. Shame that – should have kept my big fat gob shut shouldn’t I. We did initially wonder if the slowness of the service was a cynical attempt to get us to order more drinks. 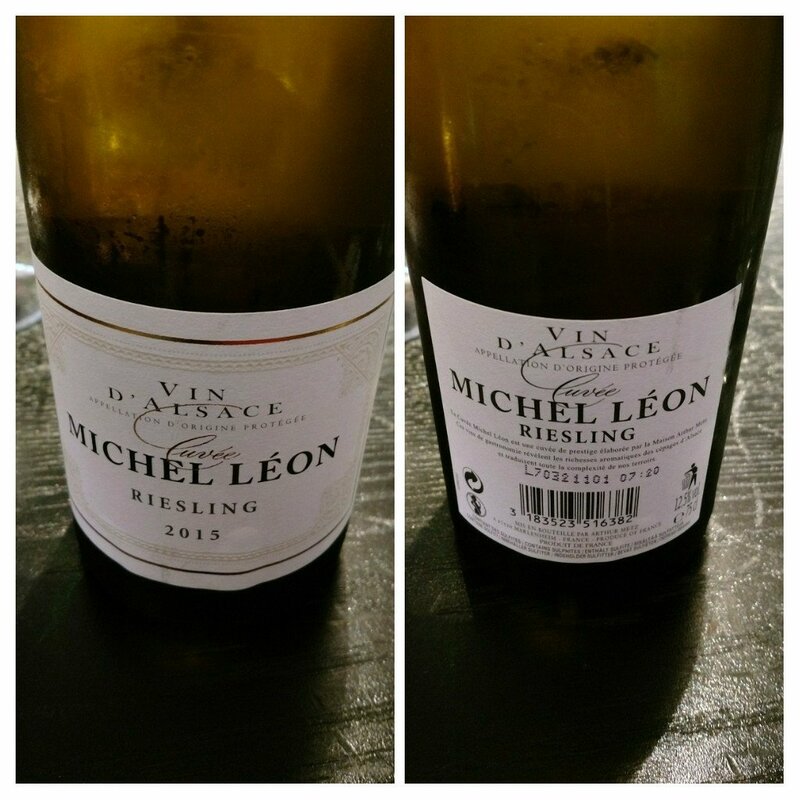 As, however, no one ever came to ask us if we wanted more drinks and we had to repeatedly try and flag down one of the (very harassed) waiting staff to get a second bottle of the riesling, we dismissed that notion. We were suppose to have Chinese tea or coffees as part of the set menu, but with there being no sign of us being asked our preference let alone it being delivered to the table (and time ticking away) rather than try and flag someone down and then endure the inevitable long wait for it to arrive we decided to call it day. We eventually managed to get the attention of a waitress and asked for the for the bill. We then waited, asked again and waited. We eventually gave up and went to the bar and asked for the bill there, explaining we had to go, it being well over 3 hours at this point. I like a leisurely lunch, but there are limits. I was in a bit of a huff by this time and my friends really were under pressure to get back home with their daughter being drop off so no picture of the bill, but it was a touch over £157 for 4 with booze (two bottles of the wine and 3 Chinese beers). The food was OK but nothing spectacular (better than if had ordered a standard takeaway, but not as much as I had hoped) and I remember it being better at the old location. The big issue, however, was the service which was pretty diabolical. I think I would still be at the table waiting for the bill a week later had we not given up the ghost and gone in search of it ourselves. I can never understand why this happens – surely restaurants want you to pay and free up the table ASAP, so why can it sometimes prove so hard to get the bill. It is not cheap so I would expect better service for the price. If you compare it to the €87 price tag for 2 for the 7 course meal (inc. booze) that was the subject matter of last week’s post, the £157 price tag for 4 looks pretty poor value in comparison. 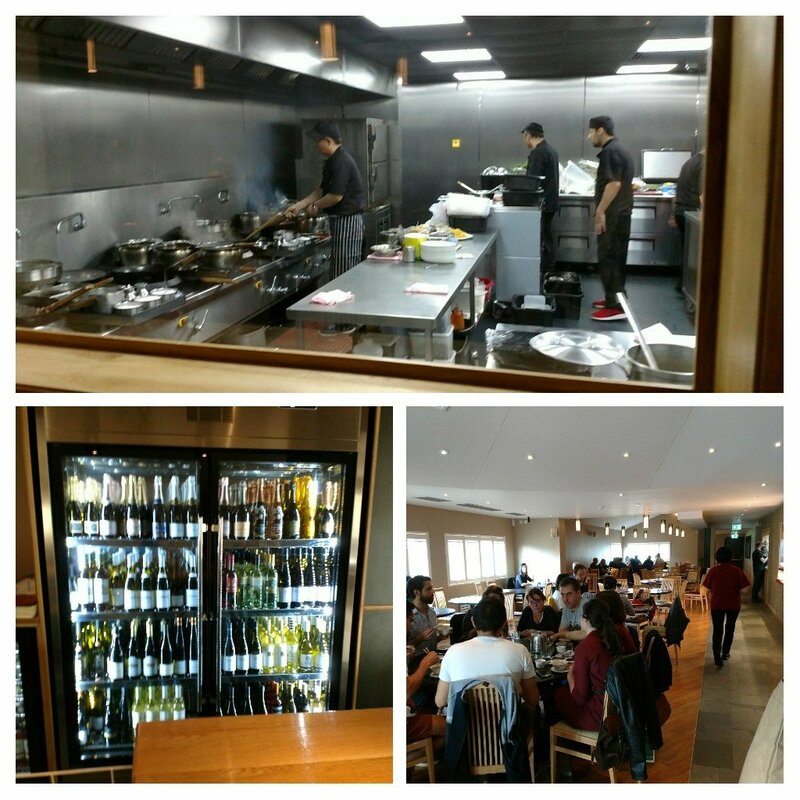 Perhaps they are in the process of bedding down into the new premises and we were just unlucky (maybe staff called in sick that day), but it seemed to me the service issues arose out of there simply not being enough staff to deal with the number of people in the restaurant. The solutions to this is, in theory, very simple. Either get more staff or take less bookings. Not doing so may look attractive in terms of reduced costs/increasing revenues, but getting a reputation for poor service can derail a business very quickly. Would I go back? If the food had been fabulous I may have forgiven (sort of) the terrible service (still think poor service can ruin even the best food). The food wasn’t by any means terrible, but neither did it really excite. All a bit of a “by the numbers” Chinese meal I thought. Mrs. SF was less kind in her assessment (if you think I’m harsh you ain’t seen nothing)!! So in conclusion, I doubt we will be returning any time soon. Shame as the new location is definitely an upgrade interior wise from the old gaff and very convenient transport wise (train station across the road and a big car park to the side – which resolved many people’s bugbear re the old location). I really hope that the service issues we experienced were a one off and we just got unlucky. If not they need to sort it ASAP. Opening hours: Mon – Sat: 12.00 – 21. 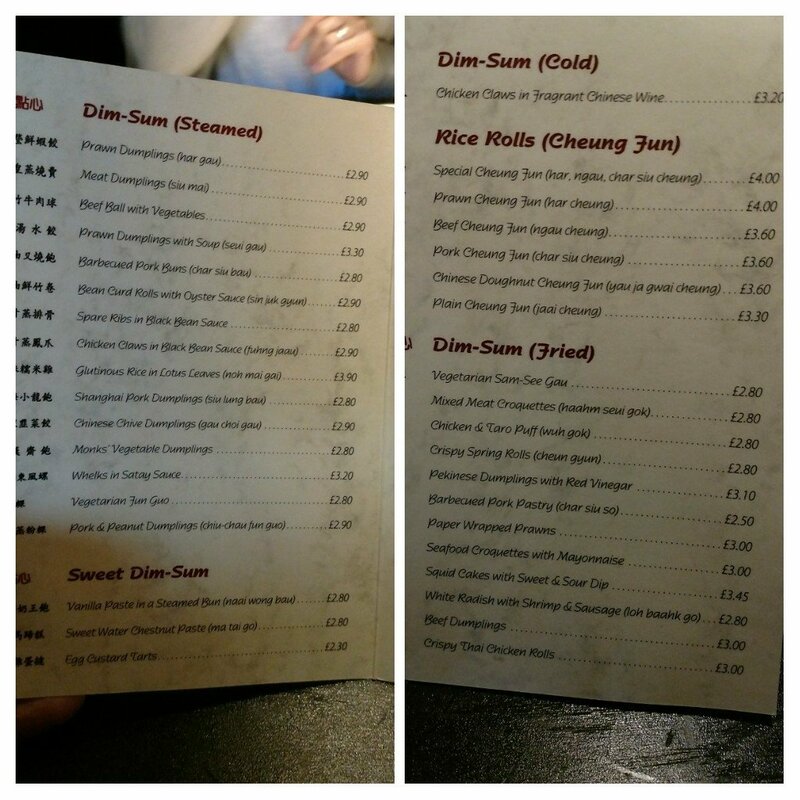 30 (last orders); Sun : 12.00 – 21.00 (last orders); Dim Sum: 12.00 – 17.00 (everyday). We went here for a family Christmas Lunch on the 29th December and had the same menu you did. Your findings on the food and service were exactly the same as ours. We were a party of 10 but we were put on a very cramped table (resulting in my mother getting a glass of red all over her when someone moved the Lazy Susan too quickly) despite there being a far bigger spare table next to us. As you said food was ok but I wouldn’t rush back. My closest Chinese is the New Garden in Aberkenfig which has better food at far cheaper prices and very prompt and efficient service no matter how busy it is. 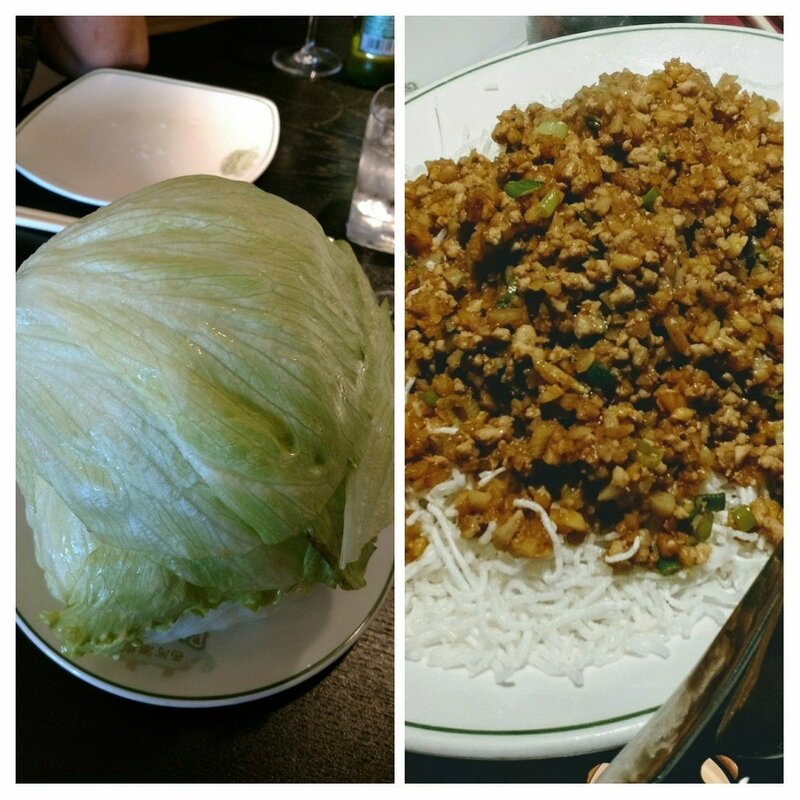 This entry was posted on Oct 29, 2017 by solicitingflavours in Alcoholic drink, Alternatives to sauvignon blanc, beef, Beer, Canton, cantonese, Cardiff, Cardiff restaurant, Chinese, Dim Sum, Drink, duck, Food, Food and wine products, France, French wine, Lunch, lunchtime, Pork, restaurant review, review, Ribera del Duero, Riesling, Riverside Cantonese, seafood, Spanish wine, steak, Sunday lunch, Wales, White wine, Wine, wine mark up, wine pairing, wine pairings.